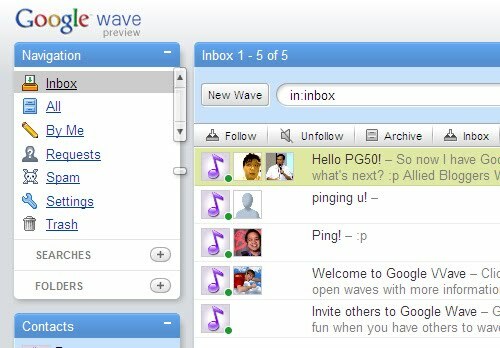 I have 5 Google Waves invites to give away, and since most of my blogger friends already have Google Wave preview, I will give these away to total strangers (lol) I mean to prospective Google Wave friends. Hehe. My rules are simple: the Top 5 people with the most comments on this post at the stroke of midnight of Tuesday, December 1, 2009 (Philippine time!) will receive the Google Wave invites. Make sure you put your email when you comment. But please don't spam me. Wah! Hint: Why not ask a question or answer someone else's question, or give your opinions on Google Wave, or ask me a question. I answer all comments on this blog. :D I am looking for prospective Google Wave friends and this is why I am wiling to give the invites to those most engaging. Google Wave has been on Twitters trending topics for quite a while now, but only when I received my Google Wave invite did I realize how amazing it actually is. I especially like the "translation" capabilities featured towards the end of this clip. What is your favorite Google Wave feature and why? just watched. the translation feature is pretty amazing. to be able to communicate with anyone in your own language whatever their language is, very cool, very clever, very useful. I had not known that was part of google wave. thanks for sharing. can someone moderate? does the person who started the wave have the authority to silence some people if required or??? I can see it being really required in my work situation as some people can't 'zip it' and can get carried away and not let other's get their point across. great article, must read CNN more often. Wow to being so clever as to come up with such brilliant ideas. did I actually follow all the rules and put my email address?? jacqui dot hudson at gmail dot com. trying to remain calm and not jump around the room going 'yay, i might be getting to try google wave'. jumping around the room on the inside, wouldn't like to scare my children.